LONDON - Nov. 20, 2018 - PRLog -- EY have joined forces with TMT Finance to harness the biggest global gathering of TMT M&A & Investment Leaders, Bankers and Advisers at TMT Finance World Congress 2018. TMT Finance World Congress 2018 will take place across three days at the Pullman St Pancras Hotel and include a two-day Leadership Summit comprising of Comms Finance World 2018 and the TMT M&A Awards 2018. "EY is leading the way in helping businesses drive growth through its capital and transaction strategy, bringing innovation and helping clients navigate complexity in an ever increasing disrupted technological world," said Oliver Wolf, Partner, TMT Transaction Advisory Services Leader, EY. "Corporate buyers and an increase in private equity and venture capital funding have driven the TMT M&A boom this year and we should see this peak of activity to continue to rise in the years to come. We're looking forward to discussing what's driving consolidation and convergence in the industry and the associated growth opportunities at Comms Finance World 2018." Wolf will moderate the Enterprise Cloud Panel, assessing the increasing demand for cloud services and remote hosting, how the business models are changing and the risks presented by the driving demand. The panel brings together five leading executives and advisers in telecommunications and technology, including Charles Nasser, CEO of Claranet Group, David Howson, CEO, Six Degrees Group, Steven Sonnenstein, Managing Director Digital Colony, Chua Hsien Yang, CEO of Keppel DC REIT Management and Eric Schwartz, President EMEA of Equinix. EY, will also be presenting the Cloud Services Deal of the Year – EMEA award at the TMT M&A Awards 2018 (https://www.tmtfinance.com/awards?utm_source=PR&utm_c...), the only global industry benchmark providing world-class recognition for outstanding achievements in TMT Dealmaking, Leadership, Financing and Advisory. TMT Finance World Congress 2018 will feature over 400 attendees from across the world and 200 speakers across 50 sessions within the event programme. Other key companies represented at the event include: Liberty Global, Vodafone, Orange, TDC, BT, Sky, Google, Microsoft, YouTube, BBC, Accenture, Clifford Chance, Citi, Channel 4, Barclays, BNP Paribas Citi, Goldman Sachs, Societe Generale, UBS, Ofcom, European Commission and many more. 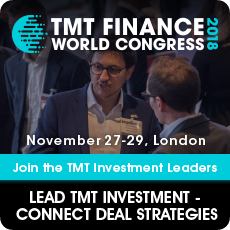 For more information about TMT Finance World Congress including tickets please visit www.tmtfinance.com/world (https://www.tmtfinance.com/world?utm_source=PR&utm_ca...) or contact enquiries@tmtfinance.com for speaker and sponsor opportunities.